Started in March, my Albums of the Decade series was based on there being 10 months left in the 10th year of the decade. What’s your favourite album of the last 10 years? (2000-2009)? Each month I look at an album that, for me, has been a musical highlight of the last 10 years. See the other entries here and here. OK, so I’m taking some liberties here – this record was actually taped in 1957. Why it’s an album of the decade we’ll get to in a moment. First, a little about the authors and what they mean to me. John Coltrane is still the pre-eminent tenor sax player – he’s influenced countless musicians, inspired generations and his peers and was incredibly prolific – recording over 50 albums in his lifetime. Had I to chose “Best Albums Ever”, John’s “A Love Supreme” would be in my top 3, if not number 1. People thought Thelonious Monk was crazy. He played the piano like he was dying while wearing boxing gloves. His improvisational style was angular to the extreme, intrusive to the ears to contemporary listeners – but playing with soloists at Minton’s Playhouse year-upon-year in the 40s (as the house pianist) gave birth to what became known as bebop. So why is this record an “Album of the Decade”? Well, for one, no one knew this recording existed until 2005. It was stored at the Library of Congress until someone accidentally tripped over it going through the stacks. Seriously. Secondly, for all of their prolificacy, the collaboration of these two giants of jazz was disturbingly under-documented. 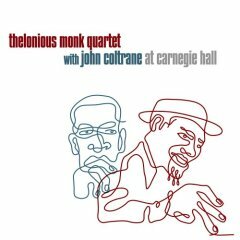 Only two other recordings of their performing together exist – one was some collaborations for Riverside and the other was an amateur recording made at The Five Spot, where Coltrane & Monk had spent many months playing together. Sadly, the latter recordings are the quality-equivalent of recording a concert with your mobile phone – that is to say, disappointing. Every note, every sound, every flurry is caught in absolute clarity. No nuance is left out, not a brush stroke missed. The musicians themselves, coming off 4 months of nightly performances together, sound almost telepathic in their ability to anticipate each other – communication and conversation, the things that make jazz great to me – are profoundly on display in this record. This entry was posted on Thursday, May 28th, 2009 at 2:07 pm and is filed under Uncategorized. You can follow any responses to this entry through the RSS 2.0 feed. You can leave a response, or trackback from your own site.